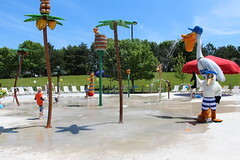 Are you interested in sliding, swimming and playing in “your own aquatic park?” Pelican Harbor is available for private events, corporate outings and birthday parties after regular swim hours for an exclusive, splashing good time in Bolingbrook. Saturday: 6:15-8:15 pm and 8:30-10:30 pm. Exclusive use of indoor lap pool, leisure pool, 2 water slides and the 10-person hot tub (for guests 18 and up). 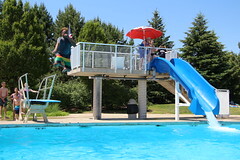 Party package includes a 2 hour rental with lifeguards for up to 50 guests. Any parties with more than 50 guests are subject to the extra guest fees listed below. Exclusive use of outdoor main pool, sand playground, Parkie's Oasis, and open water slides. 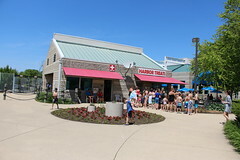 Party package includes a two-hour rental with lifeguards for up to 50 guests. Any parties with more than 50 guests are subject to the extra guest fee listed below. 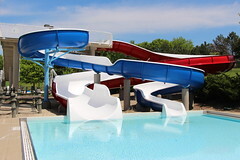 Exclusive use of the outdoor pool, sand playground, Parkie's Oasis, open water slides, enclosed water speed slides, drop slide and diving board. Party package includes a two-hour rental with lifeguards for up to 50 guests.Any parties with more than 50 guests are subject to the extra guest fee listed below. Exclusive use of the outdoor main pool, sand playground, Parkie's Oasis, open water slides, enclosed water speed slides, drop slide, diving board and lazy river. 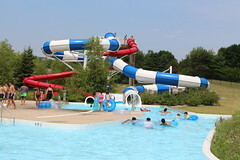 Party package includes a two-hour rental with lifeguards for up to 50 guests. Any parties with more than 50 guests are subject to the extra guest fee listed below. Exclusive use of the indoor and outdoor main pool, sand playground, Parkie's Oasis, open water slides, enclosed water speed slides, drop slide, diving board, and lazy river. Party package includes a two-hour rental with lifeguards for up to 100 guests.Any parties with more than 50 guests are subject to the extra guest fees listed below. 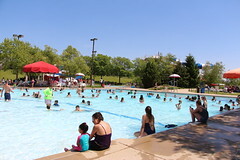 • All guests ages 3 and older (including adults) entering the pool area are included in the guest count. • You may bring outside food into the facility but we do not allow alcoholic beverages or anything in a glass container. • A 50% deposit is required to hold the date and time and the remaining balance is due 2 weeks before the rental date. • Your final head count and payment for extra guests is due the Friday before the rental. • In the event of cancellation please notify the Birthday Party and Group Sales Coordinator at (630)783-6653 no less than two weeks prior to the event or the deposit will be forfeited. • Reservations must be made at least 2 weeks in advance and are taken on first come first serve basis. Please call (630)783-6653 for available dates. Please note: In the event that inclement weather, you will have the option to move your party inside. A pool manager will contact you if the weather might impact the party. We have a dedicated Birthday Party and Group Sales Coordinator ready to take your event to the next level. Call (630) 783-6653 with questions or to book your event today.